This picture is outdated, new one to be taken soon. The TP3 Thermopak is a 3KVa power supply unit. 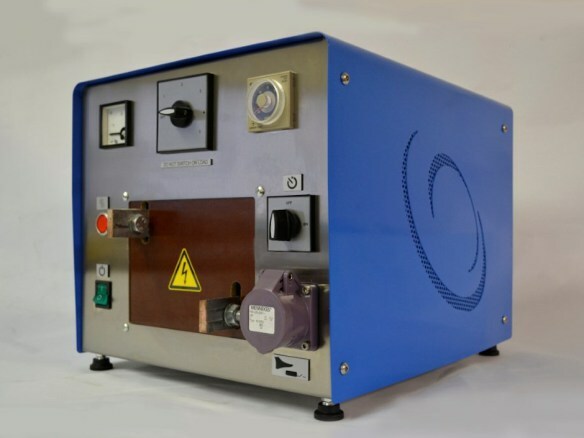 It includes a heavy duty voltage step-down transformer which converts the mains supply to a very low voltage, as required for resistance soldering, but with a secondary capable of carrying a high current. Like the TP25 the TP3 has a second transformer which supplies the control circuit (switches, indicator lights etc.) with a 24V supply ensuring that the equipment is safe for the operator to use. In addition an earthed screen is between the primary and secondary windings of the heavy duty transformer.